Sometimes a song will get stuck in my head. Not the annoying stuck in your head, but more that this fits perfectly with the way you are feeling. Or changes the way your feeling for the better. In any case, once the song finds it's niche, I listen to it over and over again. For a day or so, that song has been The Prayer by Bloc Party. It has found a groove in my mind and slotted in neatly. Another song that has done this (a few months ago, not so much recently) has been Faraway Vol 2 by Apocalyptica. From the good old US of A I give you Threat Alert Jesus. To those who don't want to follow the link, this is a Jesus figurine whose halo lights up in the color of the current terror alert level. Tacky, paranoid, bible-thumping, and more in one convenient package for only $19.95 plus tax and shipping. A few weeks ago I bought a new book. In Japan, my strategy for buying books has mainly been to go for quantity that is quality. This has meant that I've mostly been perusing the classics section of the English shelves. My most recent purchase is somewhat the epitome of this buying philosophy, the canonical long book. The book is none other than War and Peace by Leo Tolstoy. I've yet to start reading the book. It is sitting on my shelf, still in the bag from the book shop (honya). To paraphrase Monty Python: "This is not a book for reading, it is a book for laying down and avoiding." I do plan to start reading it soon. This was not helped by my birthday though. From a friend over here I got another book of the lay down and avoid variety; Crime and Punishment (can anyone think of a non-daunting book with a title of the form x and y? ), and from my Aunt I got 5 Ben Elton novels. Elton has got a good reputation as a writer and since he is somewhat responsible for Blackadder 2-4 (he was one of the writers), so those are looking tempting. A lot lighter than what I've read lately. The book I have been reading for the last few weeks (I think I borrowed it from the Takarazuka school the day after I bought War and Peace) is Mobile Suit Gundam, a novelization of an anime series. It didn't seem that great as a novel, but I think giant robots flying around and fighting in space is always going to be better in a visual medium. I might try and acquire a few episodes to watch if I can. I'm going to try and start on War and Peace soon, and see how I go. On Sunday April 15th, at 12:19 pm an earthquake measuring 5.3 on the Richter scale stuck Kameyama city in Japan. The earthquake caused on minor damage, but was felt as far away as Nishinomiya. The school where I work is in Nishinomiya. I started work at 11:40 am yesterday. The first lesson ended at 12:20. The schools clocks must be a little off the official time, as just after my first lesson ended, the building started shaking. Not a lot, but obvious to everyone. I will admit I was a little nervous while it was happening (I backed into the corner (not that hard) and put my arms next to the wall in preparation to having to brace). The wobbling went on for about 30 seconds to a minute. After one of my students got out his cell phone and checked the news on TV (some cell phones are also mini TVs. I've seen people watching shows on their phone on the train) to find out where the epicenter was and how strong it was. 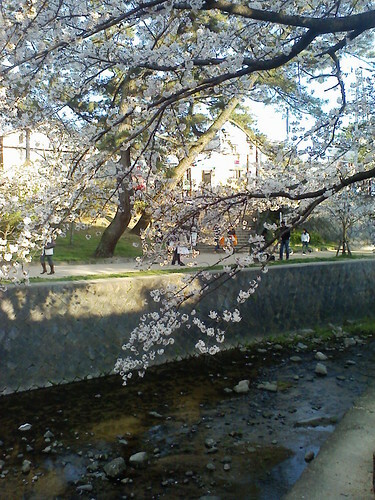 Last week after going to the cherry blossoms in Shukugawa on Tuesday, I didn't end up going to Kyoto as I'd planned. I slept in quite late and then decided it was too late to go to Kyoto. Instead I went into Osaka and walked along the river and then went to Osaka castle. 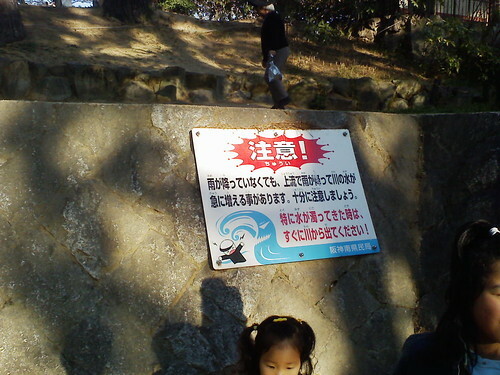 The river was OK, but my impressions weren't as good as Shukugawa. This wasn't helped by the fact that the weather was cold and wet. It was however a river as opposed to a hyped up drain. Osaka castle did not live up to what I'd heard, but then I was mostly walking around with my head down so my glasses didn't get covered in rain, so I may have missed some of it. To top it off, the next day I woke up with a bad headache (the most accurate description is that it felt like a metal spike going in through my forehead and out the back of my head where the head meets the neck), and a cough. No pictures for Wednesday to show. I took some, but there wasn't anything great. While I like the idea in this comic, and may even give it a go some time, the sheer evilness of the ending is just awesome. 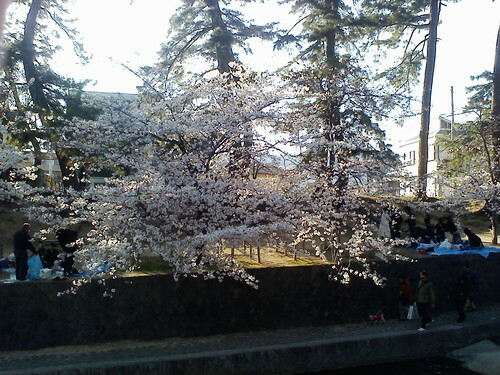 At the moment it is cherry blossom season. 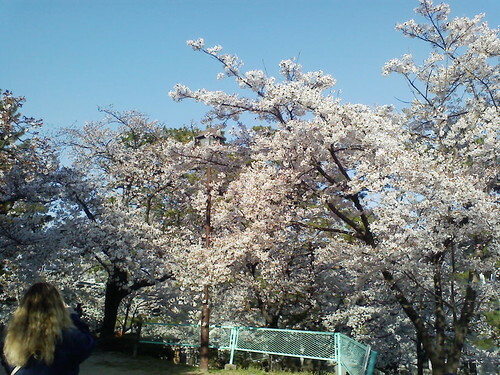 And for what was probably the first time in my life, I thought "Lets go look at the flowers." 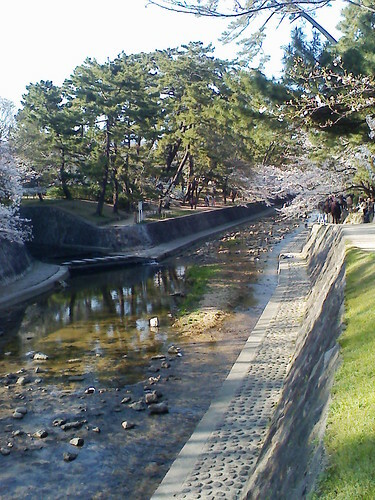 Today I went to Shukugawa park, which is one station away from where I work. 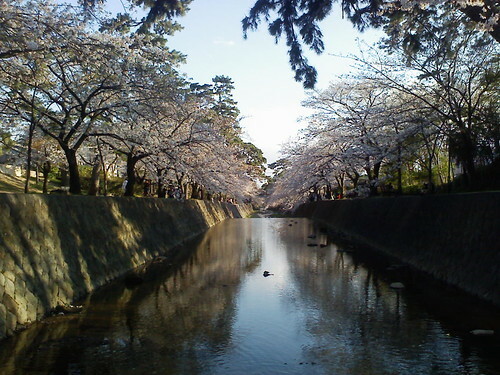 The park is a narrow (about the width of a road) stretch of land on both sides of Shukugawa "river" (the river has built up banks, paths, stepping stones and would be more aptly described as a canal, in that it seems quite man made). I'm thinking of going to Kyoto tomorrow, which is also reputed to be quite nice. Anyway, the flowers were quite pretty. Here are some photos. Here is an article with some maps that have been distorted to show how countries compare on things other than simple geographical area, such as alcohol consumption, military spending and more. I was initially surprised at how large Japan is on the alcohol consumption map, but after thinking for a few moments, it's not that surprising. Anyway, here is the map. 4: Obama is the third African-American senator since Reconstruction. Reading up on the topic on Wikipedia shows that he is actually the 5th, but that's not what I'm wondering about. The thing I'm wondering about is why they make the point of starting to count African-American senators at the time of the Reconstruction. Why not just go from the founding of the US. It doesn't make the number that much bigger. To be blunt, there isn't a whole swath of pre-Reconstruction African-American senators that people are trying to hide. Why make the distinction? Wikipedia states that there have been 5 African-American senators, the first of whom was Hiram Rhodes Revels who served the last year of another senators term in 1870. He has been followed by Blanche Kelso Bruce, Edward Brooke, Carol Moseley Braun, and the aformentioned Barack Obama. While it is true that all the African-American senators have served after reconstruction, it seems odd to say the he is the 5th African-American senator since reconstruction, instead of just the 5th African-American senator. If Obama were to become president, he'd be called the first African-American president, not the first African-American president since reconstruction. And yes, I realize that the Reconstruction was a big time of change in the status of African-Americans in America, but I still don't see why you should start counting at that time. The title is something that was on a students t-shirt. It's unrelated to what follows. Talking seems to be very effective. I need to do it more. Last week Tyrone, a friend from university who is doing the Nova thing in Tokyo came down to Osaka for a few days and we caught up on Monday night. This is the second time I've seen someone I've known for more than 6 months in Japan (the first was Mum). He joined the regular Monday evening gang at Captain Kangaroo's and then the B-Trip. We mostly just talked and caught up, comparing experiences in Japan and what's been going onback in Australia. 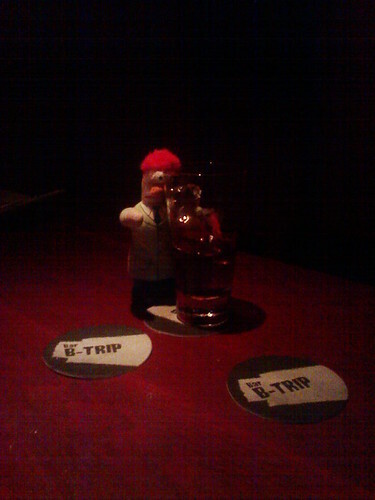 I even managed to get my own Beaker photo.